First the Parsley Dressing was prepared. It suggests oregano, but mine died during our crazy winter so fresh marjoram was used as a substitute. Also, I put garlic in EVERYTHING, so it was added, too, even though it's not listed as an ingredient. After mixing, it seemed a bit 'tame' for us. Handsome Husband prefers bold flavors. After a couple of hours in the fridge, the dressing was GREAT. Let it hang out just a bit before using. 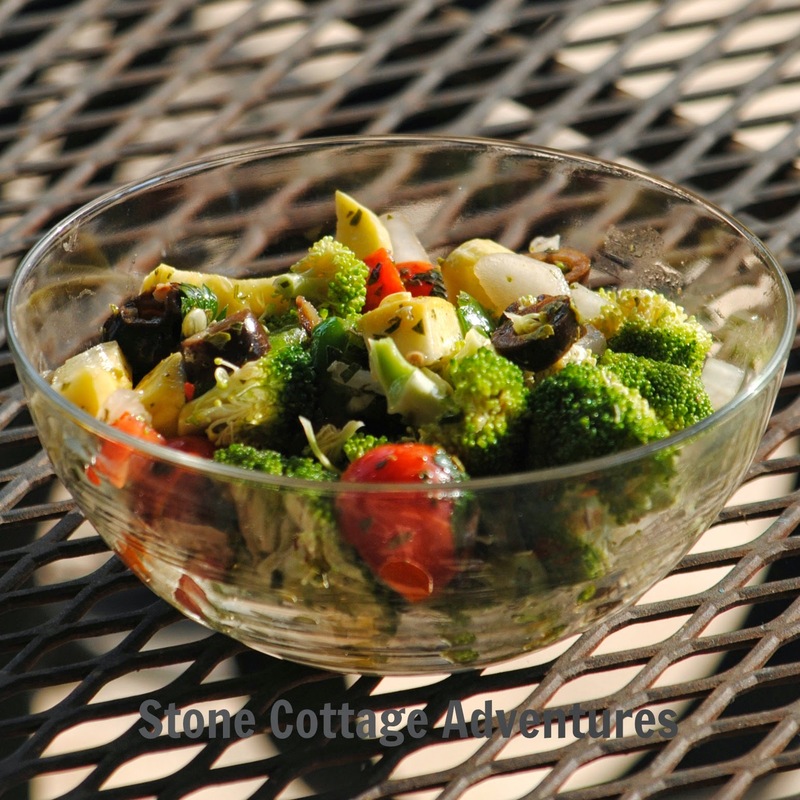 The Chopped Broccoli Salad was prepped quickly. Since we are harvesting lots of goodies from our garden right now, yellow squash and a bell pepper were tossed in with the rest of ingredients. 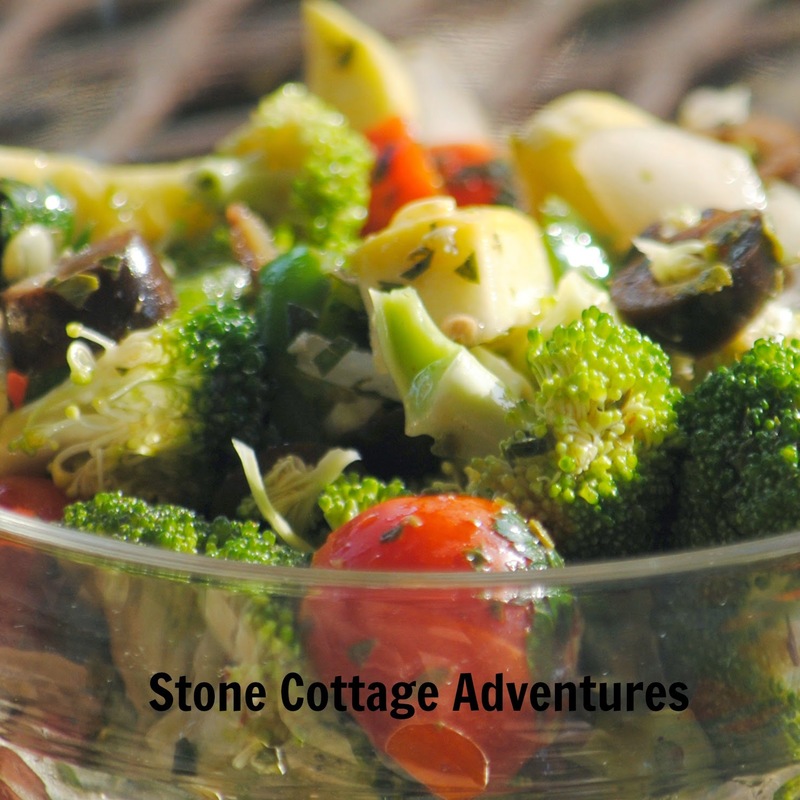 I think there are all kinds of fresh vegetables that could come and go in this salad and still be tasty. This was a lovely summer harvest treat! 'Definitely making this recipe again! I hope you'll come back Thursday for another recipe review AND a giveaway! Looks delicious! I am not a big fan of broccoli alone, but make it into a broccoli salad and I love it. I will have to give this one a try. Nothing beats a cool summer salad! This looks great and your additions sound lovely!